Our SUPEK7 Eco Kraft Stand Up Pouch offers an attractive, eco-friendly choice coffee, cookie, and snacks. 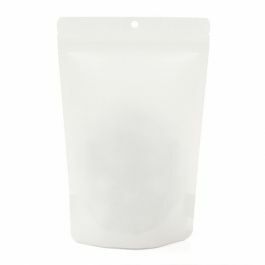 This pouch measures 5 7/8" x 3 1/2" x 9 1/8" and holds 6-11 oz/170-312 g. This 5 mil pouch is lined with PLA material and a protective coating, providing a high barrier for food products. Pouch is open ended (no zipper) for easy filling. 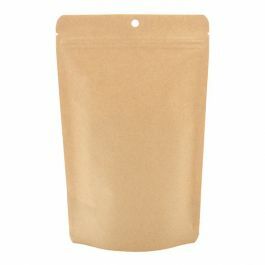 The earth-tone color of this Eco Kraft Stand Up Pouch is a perfect fit for natural products. The SUPEK7 pouch measures 5 7/8" x 3 1/2" x 9 1/8" and holds 6-11 oz/170-312 g. This pouch comes open ended (no zipper) for easy filling and can be heat sealed for a secure closure. Package rice, grains, powdered mixes, coffee, bath salts, and more. The pouch is 5 mil thick and made of 65 gsm Kraft paper for outstanding durability. The laminated inner lining is made from plant-based PLA and features an ALOX protective coating for high barrier protection. This pouch is made from 100% certified compostable materials. Food safe.